A lot of Companies provide a free shipping offer for the orders that come to a certain value. ZenCart engine can also provide this option. Press the Modules menu, and select Order total. 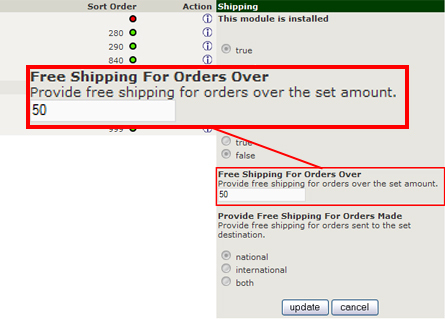 From the drop down list, click the Shipping module and then the Edit button. Set the minimum amount for free shipping and click Update at the bottom for your changes to be applied. This entry was posted in E-commerce Templates, ZenCart, ZenCart Tutorials and tagged e-commerce, shipping, ZenCart. Bookmark the permalink.